We have seen some of the major arguments that Cicero uses against the Stoics, in book IV of his De Finibus Bonorum et Malorum (On the Ends of Goods and Evils), and I’m going to complete my brief analysis in this post. This is obviously a position antithetical to Stoicism, which very much puts Reason in charge of redirecting the passions, combating some (e.g., fear, anger) and fostering others (love, a sense of justice). Modern cognitive science strikes a balance between the Reason First and the Passions First positions, but at any rate it is not clear how Cicero thinks this is going to help his pro-Aristotelian case, since Aristotle certainly would not have agreed with Hume! I think Cicero is wrong on both counts here. First, there is an important conceptual distinction between something being “evil,” i.e., necessarily bad, and something being “irksome, annoying, hateful,” etc.. For one thing, because pain can actually be good, as in then pain you might have to suffer during an operation to save your life, or, more modestly, to improve your health through strenuous exercise at the gym. So pain is not inherently evil, it can be good or not, depending on the circumstances. More importantly, though, Cicero simply refuses to accept — without argument — the crucial distinction that the Stoics make between the moral sphere and everything else. They reserve the label of “evil” (whatever that means, metaphysically) for morally unworthy actions, and contrary-wise the label “good” for the practice of virtue. This, however, does not imply that other things may not be “irksome, annoying, hateful” and so forth. Second, the Stoics were right that one’s mental attitude toward pain does actually affect one’s experience of pain. There is plenty of modern empirical evidence of this fact, and the Stoics — who were keen observers and good psychologists — had intuited it (and, likely, experienced it in the first person). Of course this doesn’t mean that one can simply think one’s pain away, but read this brutally honest and compelling account of a modern Stoic dealing with chronic pain and see if Cicero wasn’t a bit too hasty in his dismissal of the Stoic doctrine. Here Cicero is mentioning some of the most paradoxical of Stoic doctrines, such as that we are all equally unwise, a concept often illustrated by an analogy to someone who is drowning at the bottom of the sea compared to someone who is doing so in a meter of water: while the latter is much closer to the surface, he is drowning just the same. Or the idea that all “sins” are equally bad, which critics take to mean that there is no difference between stealing a lamp and murdering someone. It should be clear by now why Cicero is mistaken in this, and it is rather ironic that he is supposed to be talking to Cato the Younger, who most definitely did not abandon “participation in politics [and] the duties of life.” On the contrary. But here is another way to put the point: economists make use of the concept of lexicographic ordering of preferences to account for why standard market theory cannot explain certain rather common human behaviors. For instance, I assume that you wouldn’t sell your daughter, say, in exchange for a Lamborghini, or whatever other very costly object you’d like to possess. Why not? Because your daughter belongs to a higher lexicographical set of preferences than a Lamborghini, and there is no trading off one against the other precisely because they belong to incommensurables sets, unlike the perfectly fine trading off of a pile of a cash for the above mentioned Lamborghini. So all the Stoics are saying is that there is a qualitative distinction between Class-A goods (wisdom, virtue, integrity of character) and Class-B goods (health, wealth, education). While this means you are not to trade any Class-A goods in exchange for any Class-B goods, it doesn’t mean at all that you cannot pursue Class-B goods, so long as you don’t do it in a way to compromise any Class-A ones. Go ahead, if you have enough cash buy yourself a Lamborghini. But don’t sell your daughter for it! This entry was posted in Cicero, Critics of Stoicism on August 26, 2016 by Massimo. I did not see an answer to the objection at the beginning of the essay about the necessity to excite desire and passion to initiate action. Temperamentally i am very inclined to stoicism but that Hume quote has been in my mind ever since i heard it. I dont know how it square it with my more passive philosophy. It takes the passionate and unreasonable man to get things done. Politicians often have to be inspirational and passionate and in being so are often inaccurate. I am so uncomfortable when i hear leaders trying to inspire people because i am aware of all the caveats and conditionals they dont mention. Yet it’s necessary to leave them out to inspire. This is not just external but also internal. How can i inspire passion and action in myself and others when i am constantly aware of all the conditionals and the reasons things are like they are and not different. 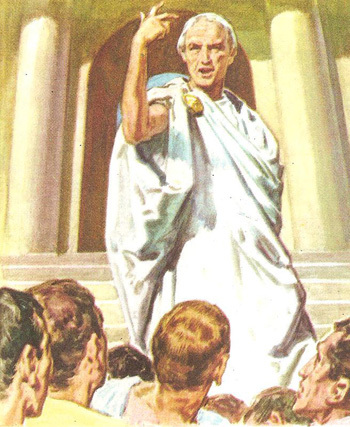 Where not some Stoics ‘great’ orators? Not just progress, but much evil besides. Hitler, Stalin, Mao, Mussolini were passionate. Shaw is always fun. I don’t think he is right. I think stoics mean something else by ‘passion’ and are not advocating passivity. To what synred has already posted I can add the following. I think Hume was flat out wrong: when reason is the slave of passion then really bad stuff has a tendency to happen. But if he meant more modestly that we don’t do things because of reason along, that we need to have desires, then yes, and that does square with both modern cognitive science and the Stoic theory of the graduate development of virtues — see for instance Becker’s book, A New Stoicism. I seriously doubt it. Besides, “passion” is a generic term that could very well encompass the Stoic positive emotions, such as love and concern for justice. It’s the unreasonable (if by that one means irrational) part that I object to. Politicians are master sophists, capable of manipulating crowds. But it doesn’t mean that they believe what they are saying, or that they themselves are moved by negativ emotions (such as fear or hatred). Roosevelt and Churchill were passionate and (mostly) reasonable. The answer to Cicero and Hume is that the cultivation of positive virtues will “supply the impulse to desire the things that are in accordance with nature”. I think the answer is here in your blog I have been reading your writing on Becker and “virtue as ideal agency” (still not sure how this works). I would like to see this developed more. (probably is I just have to find it). My other thought is that perhaps i’m asking of stoicism something it is not really its purpose. The goal of stoicism is equanimity and calmness of mind. I would not want to make it all things. I appreciate the answer about good orators/politicians: “one can feign anger and passion to move others. But one shouldn’t be transported by it”. No, probably Roosevelt didn’t feign passion, though he was not a Stoic anyway. But right, reasonable and passionate are not antonyms, and from a Stoic point of view there are such things as positive passions. Remember, Stoicism isn’t about abolishing emotions, pace Mr. Spock. This quote makes absolutely no sense to me. It is a complete contradiction. To maintain the only Good is Moral Worth is to do away with care of one’s health? To neglect yourself is harmful, and to deliberately harm something is in my opinion bad/evil. Continuation of self neglect will eventually will lead to death which is technically suicide, which is also bad. How can one do good in their communities without participating in some sort of politics? Silence is never an option. There are people that do evil things, and there are others that see evil things being done and do nothing about it, which is even more evil in my opinion. One has to be of service to themselves and their surroundings, there is nothing good about ceasing your own existence in order to avoid “evil”, that is cowardly, that is lazy, and if something is in your will power to promote good in order to prevent something evil from happening or to fight evil…that in itself is an evil action. Is not one of the virtues wisdom, which entails honesty, and a sense of reality. Is it not wise to be healthy, to take care of your finances, to participate in your society? Where is the conflict with virtue if I try to be wise in practical living? Right, the quote about the idea that pursuing the only moral good is to do away with everything that actually matters to a human being, I agree, it’s the result of Cicero (willful?) misunderstanding of the Stoic precept. There is a concern I have with the concept of preferred indifferents that Cicero alludes to. Is eudaimonia enhanced by cultivating preferred indifferents ( of course, not at the expense of the cardinal virtues)? I recall that it was argued that cultivating preferred indifferents can facilitate the pursuit of the cardinal virtues. The best way I’ve come up with to explain this is to think in terms of what economists call lexicographic preferences: virtue is in preference set A, while everything else (wealth, education, etc.) is in preference set B. A is what we care for above all else, and no element of A can be traded off for any element of B. But so long as pursuing an element of B doesn’t get in the way of our preferences for A, we are good. Practical (non-Stoic) example: my daughter’s welfare is in a higher preference set than my liking of pizza. I can enjoy pizza, but not at the cost of compromising my daughter’s welfare. I hope this helps! Thanks for the reply. But should I pursue pizza? ( not at the cost of any virtue). If my life is better with pizza , shouldn’t that be one of my goals? Does a stoic embrace some Epicurean tendencies/goals as long as they don’t violate the practice of Virtue?